The Mercedes brand is one of the few that combines comfort and performance so well. In fact, the vehicles produced by Mercedes are seen as some of the most sophisticated machines, at this point. 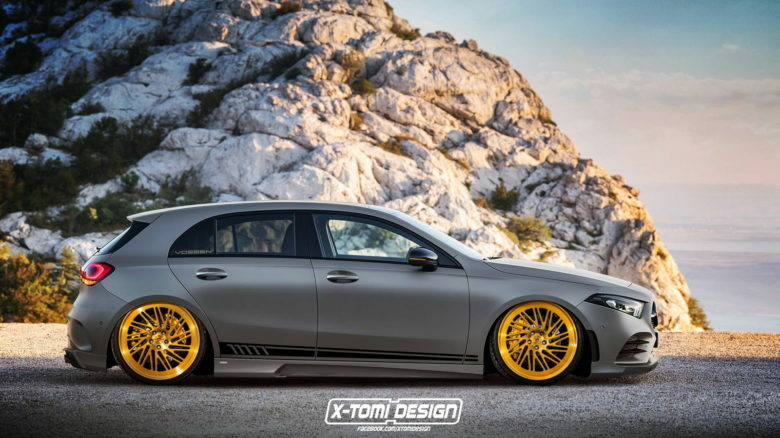 It is exactly because of this that X-Tomi decided to create a rendering of the most recent 2019 Mercedes A-Class, a vehicle that is praised for the complete driving experience it offers. It is truly a shame that the rendering is not real, as the end result is amazing. The first thing that will attract your attention when looking at this particular rendering is the nice set of golden rims fitted on the vehicle. Paired with yellow brake calipers, the rims seem to fit in well with the rest of the car’s design. The dark grey paintjob is the perfect choice for this Mercedes A-Class rendering. The color of the car brings out the shiny, gold rims by means of heavy contrast. The quality of this particular rendering is hard to believe. All added elements are so well integrated that you get the impression you’re looking at a real ride. Lowering the car gives the vehicle a slightly more aggressive look. Its new stance mixes well with the added rims and the new paintjob. The design is completed with the addition of a set of black vinyl lines near the lower part of the doors. This addition contributes to the sporty look of the car. The car’s look is simplistic. It is exactly this simplistic aspect that allows for the car’s defining features to be brought out to light. Nothing about this particular rendering is exaggerated. The fact that all the added elements fit well with each other gives the car a balanced look. Regardless of how you look at it, the rendering by X-Tomi is definitely a success. It wouldn’t come as a surprise if later on somebody would decide to use this rendering as an example for upgrading his real 2019 Mercedes A-Class. In fact, it would seem like a grand idea to put to practice something that has only been presented theoretically. We’ll have to wait and see, though. As the 2019 Mercedes A-Class is being made available around the world, people are starting to search for authentic ways to individualize their rides. X-Tomi might have given us one of many customization choices that might be possible for the A-Class.